Nick and that Beautiful Beast called Bone Cancer: Winter! 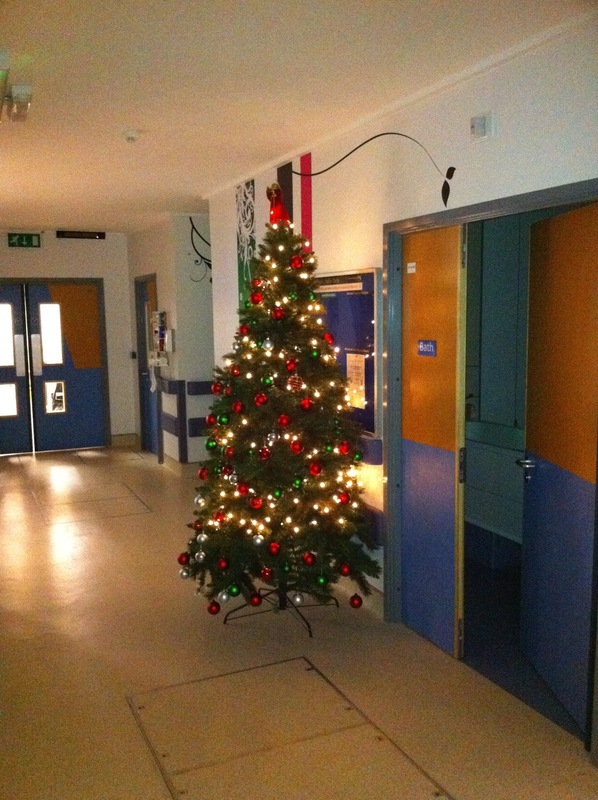 Christmas tree on Ward 78! I was now starting to become more and more ill as the effects of the chemotherapy built up. At this point most of my eyebrows and eyelashes had gone too and I was requiring blood transfusions every two weeks roughly. I was always tired at this point. For my fourth chemotherapy I had to travel to Leeds through horrendous weather. You know it's cold when ice starts to form on the inside of the car window! 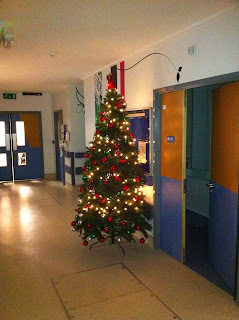 I helped set up the ward Christmas tree (see picture!) and the rest of the ward decorations! Because of the way my chemotherapy was timed I ended up having to travel home at 3am in the freezing weather. I badly needed the loo on the way home (having been on constant hydration for the previous four days) so we had to stop the car and pull over somewhere. It was 3:30am and -15 degrees celsius. Probably the coldest I've ever been! Following my fourth chemotherapy at the beginning of December, I celebrated my 17th birthday on the 9th of December. I had a law trip with Sixth Form to go and watch some court cases in Hull, but afterwards myself and a few friends (Lauren, Ruth and Yas) all went for Pizza Hut, which was good although I was somewhat limited in my choice of food because I wasn't allowed to eat fresh salad or fish. I was booked in to have another load of scans before Christmas so that I knew just what was happening with my cancer. It was around this time that I was told that sadly my doctor, Professor Ian Lewis, would be leaving after 25 years at Leeds General Infirmary. My new consultant was to be another member of the Teenage Oncology team, Doctor Bob Phillips. Another one of the people who I owe my continued existence to. I had my bloods checked on the morning of Christmas Eve and they came back in the evening. It looked like I would be spending a good few hours of Christmas Eve in hospital having a blood transfusion! They gave me a smaller amount of blood on Christmas Eve so I was able to go home for Christmas Day. It was times like this that I truly hated being ill more than anything. I spent my Christmas Day at home, having a full Christmas dinner and falling asleep at the dinner table because of how tired I was! I then slept for the whole afternoon and the evening! I was so unbelievably tired and I felt so ill. I went back to Hull Royal for another blood transfusion on Boxing Day and was stuck there for 6 hours. Because I was at risk of getting infections I was confined to a single room at the very top of the hospital, and as there isn't a Teenage Cancer Trust Ward there it was a very small room with no proper TV and the nurses weren't properly trained to deal with cancer patients. I did however, manage to get a photo during them six hours and I have to say the view (along with the various antics of the people of Hull!) kept me somewhat occupied! I have to say it was a Christmas I would never forget. I was surrounded by my family but I worried that this would be the last Christmas I would have. Not just a slight worry, but an all consuming fear that this was it. That this was the last Christmas I would ever have. I think I appreciated just how lucky I was to be around for Christmas in 2011.